Both sexes fully winged. Body and legs dark brown, tarsi and apex of fore tibiae yellow; antennal segment III yellow, IV–VI variably yellow in basal half; major setae dark brown, tergite IX setae paler; fore wing deeply and uniformly shaded. 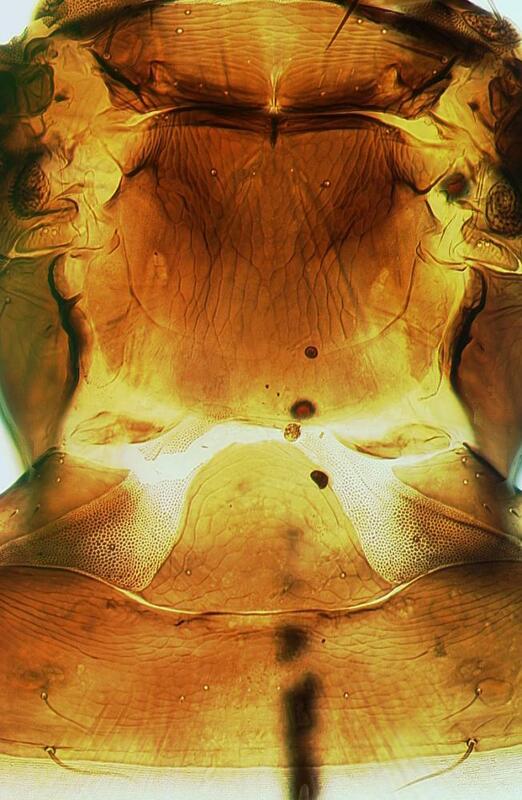 Head scarcely longer than wide; maxillary stylets retracted to postocular setae, about one fifth of head width apart medially; post ocular setae pointed, shorter than dorsal eye length; mouth cone extending between fore coxae. Antennae 8-segmented; segment III with one sensorium, IV with three sensoria; VIII short and broad at base. Pronotum with five pairs of softly pointed major setae, posteroangulars longer than half median length of pronotum; epimera sometimes with a second pair of short stout setae; epimeral sutures complete; prosternal basantra not developed, ferna present, mesopresternum lateral triangles weakly joined medially. Fore tarsus without a tooth. Metanotum weakly reticulate medially, median setae small and acute. Fore wing parallel sided, with about 12 duplicated cilia; three softly pointed sub-basal setae sub-equal in length. Tergite IX setae S1 and S2 pointed, slightly shorter than tube. Male similar to female; tergite IX setae S2 short; sternite VIII without a pore plate. L. ilex is host specific to the Californian Toyon or Christmasberry shrub. 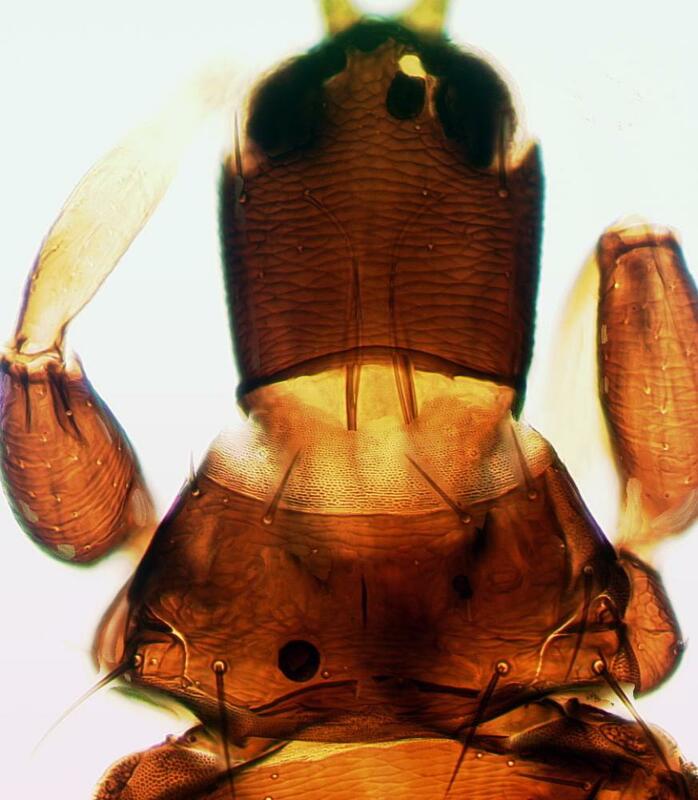 It is similar in color and structure to the lily thrips, L. vaneeckei, with long finely pointed pronotal epimeral setae, but has darker mid and hind tibiae. Contrary to statements in Cott (1956: 56), antennal segments IV, V and VI are variable in color and sometimes almost entirely brown. As a result, such specimens are not readily distinguishable from specimens identified as L. dumosus and L. eremicus. Currently, there are 290 species listed in the genus Liothrips, although 30 of these are placed in two sub-genera known only from Asia. As a result, this is larger than either Thrips or Haplothrips, these three being the largest genera of Thysanoptera. However, in comparison to both Thrips and Haplothrips there are far greater problems in Liothrips in species recognition. A particularly high proportion of the described species are known from single samples, or even single individuals, resulting in little knowledge of variation within and between species, and thus the general assumption that most members of the genus are host-specific requires extensive testing. Stannard (1957) listed 32 species of Liothrips from North America, and subsequently (Stannard, 1968) included 14 of these in his keys to the Illinois fauna. 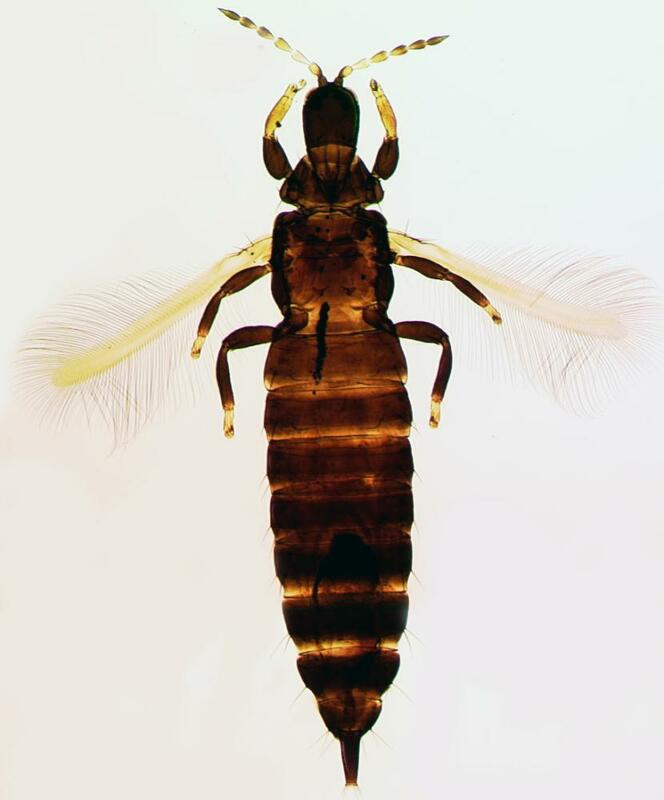 Cott (1957) treated 11 species from California, two of which he placed in Rhynchothrips, but currently from this State there are 13 Liothrips species listed (Hoddle et al., 2004) of which several cannot at present be recognized. Breeding on young leaves, inducing irregular galls and leaf distortion; pupating in soil (Bailey, 1938: 64). Causing leaf damage to Californian Toyon or Christmasberry shrub, a plant of horticultural importance.